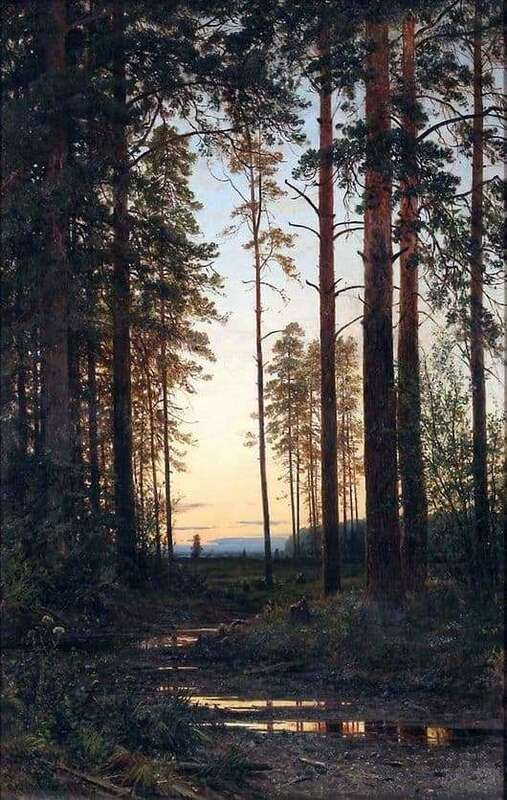 The trees in the paintings of I. Shishkin are especially majestic and monumental. Through them, the famous artist, the master of the forest landscape, conveys all the greatness of the forest. In this regard, the picture “Twilight” is no exception. Moreover, the forest depicted at dusk makes it more mysterious and mysterious, as it should be in principle. In this picture Shishkin did not change his style. He only improved the image that gives his landscapes. The romantic image of the forest at dusk has become more expressive. Here he also managed to maintain unity in tonality. A wet, sometimes wet trail leads out of a pine forest (in Shishkin, powerful, strong and monumental oak and pine prevail in landscapes) to the edge of the forest. In the distance, the yellow horizon, which transparent color smoothly passes into the summer blue sky. In general, Shishkin has a lot of fundamentality and consistency, and in most cases he has a forest in its heyday. Naturally and in detail, the soil gives off moisture, which is felt visually due to the skill of the artist. For the painting “Twilight” is characterized by the depth of “absorption by nature.” From the forest and its edge to the horizon at dusk, one alluring depth that is a little scary, but generally inspiring. A large space, which opens a gap between the trees, turned out to be complete. Twilight is not only on the horizon. Reflection of their yellow-red color and in the foreground – in the water on the soil of the forest. In the foreground, thanks to the light hand of the author, the confusion of light characteristic of twilight is also felt. This incomplete illumination is the basis of the romantic image of Shishkin’s forest at dusk. In order to portray the forest in this way, it is necessary to know and love it in the same way. Probably this was the secret inspiration of the great Russian landscape painter.